1. The Style At Home Booth. Style At Home is one of my favourite design mags so when I heard via twitter that they were collaborating with Alanna Cavanagh, one of my favourite artists, I knew it would be a booth-made-in-Heaven. Designed by Margot Austin, the booth featured preppy stripes and fresh & vibrant colours from the Style At Home paintcollection from Beauti-Tone. It was shot of springtime amidst the sea of black-clad design show goers. 2. Italian Ceramic Tile - Italian Trade Commission. 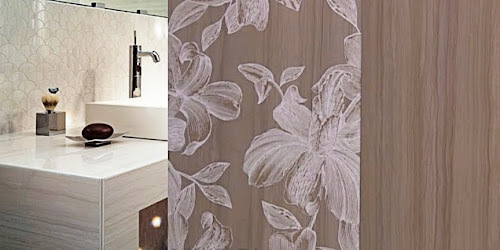 Gorgeous ceramic tiles in milky hues, some fashioned to look like wood, others embellished with lacelike or tone on tone patterns. The perfect backdrop to a modern bathroom. 3. Elte Second Life rugs. 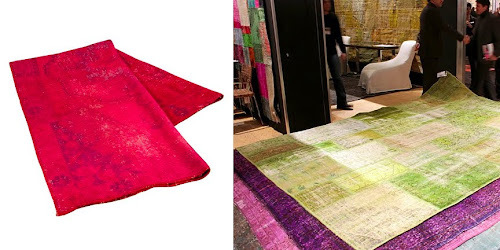 Rugs otherwise headed to the landfill are given new life through a process of sand-washing and dyeing. Its a great way to extend the life of these old rugs. I picture them juxtaposed against traditional wooden floors or bringing drama to neutral spaces. 4. Edgewater Studio. I posted about these tiles a few weeks ago and let me tell you, they were even more beautiful in person. A bit pricey (my favourite the Maven Mosaic runs about $90/sq.ft), its best to use these in small applications like a backsplash or accent wall in a shower. The colour combinations are endless but I was really drawn to the watery blue and green hues. 5. IDS. This year, the IDS show floor was given its own look through the collaboration of designers 64th and Queen and art directors Sali Tabacchi. From the rockstar feel of Krups Stage, to the uniforms of IDS staff, and the LED tower greeting you at the entrance, there was much more of a cohesive look to the show this year. 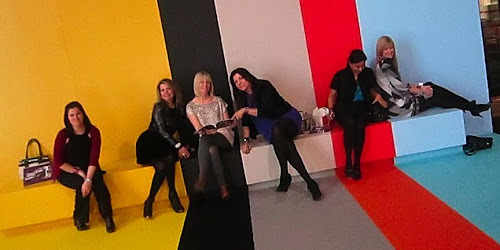 Even the creative striping at the entrance inspired some bloggers to give their own rock-star poses. How about you? Any favourites from IDS? I find its a great event for inspiration though I'm not sure how many of the products make it into the homes of middle-class homeowners like me. Looks like a fun place for lots of inspiration! Loved all of your pics- I think I need one of those rugs and Edgewater just blew me away. The Style at Home booth was one of my favourites- so pretty! And glad you liked the photo! Andrew Metrick from Elte here. I can't thank you enough for including us in your top 5 for IDS this year. We're all overwhelmed with the positive feedback from the design community. It was an amazing show this year and we met some truly amazing people. Hope to see you around Elte and Ginger's sometime soon. All the best! 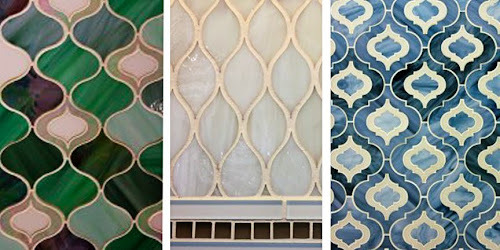 Everybody's fave from the show seems to be the Edgewater tiles - I'm totally on that bandwagon! And I really liked the Ooi paper light fixtures, and pretty much everything in the Frini Furniture booth. And the Corian flowers and hanging chair were fab! First time visiting and I am so impressed. Colorful, fleshed out, I hope my blog can look that good one day. I have a blog about housing and family and renovations. It's a good blog, or so the folks on the Redfin forum say. Also, my mother likes it. And my husband. I'm told they don't count and probably, they don't. The reason I have to use them as references is that my blog isn't getting the traffic my husband, mother, and buddies on Redfin think it should. And the reason for that, (don't reasons just beget more reasons?) if that I've done doodly to promote it. So, dear fellow blogger, you are my first step past doodly. Please give my blog a look-see. Skim some of the other posts, I cover how the LA housing bubble affects me, as well as family and renovations. If you like, maybe you'll link to me, and then I'll link to you, like buddies on a field trip. If you don't like, well, suggestions for improvement are always welcome. HI Jen, great post - and I must have missed your post that you organized Pecha Kucha - I have to tell you it was a highlight of my show - I especially LOVED the photographer George Whiteside and the architects that went before him - can you remind me of their name? Their stuff was just inspired! Wish I had seen you there! Dean and I enjoyed the show...seems we missed a few things though. Lol. Our brief recap is on the blog here: http://akadesign.ca/?p=2745. Lizinka -so glad you enjoyed the Pecha Kucha! George was so fun, wasn't he? The presenter before him was Brigitte Shim of Shim-Sutcliffe Architects. Their work is spectacular. I want that modern cottage she featured! Saw you briefly at the Krups Stage and you quickly went to the back with some other people (that was before Pecha Kucha) ... you must be doing some last minute running around. Too bad I didn't get to meet you in person this time. Will catch you on your next "outing"! took me a while but finally did an entry for the RxR creation. Hope you enjoy it too!